Based on IBM’s fictional data set created by their data scientists. Employee Attrition is when an employee leaves a company due to normal means, (loss of customers, retirement, and resignation), and there is not someone to fill the vacancy. Can a company identify employee’s that are likely to leave a company? A company with a high employee attrition rate is a good sign of underlying problems and can affect a company in a very negative way. One such way is the cost related to finding and training a replacement, as well as the possible strain it can put on other workers that in the meantime have to cover. This dataset was produced by IBM and has just under 1500 observations of 31 different variables including attrition. 4 of the variables (EmployeeNumber, Over18, EmployeeCount, StandardHours) have the same value for all observations. Due to this, we can drop these since they won’t be helpful for our model. Next, the column “ï..Age” was renamed to “Age” to make calling this variable simpler. Finally, for build and testing models, the dataset was split into a training and test set at 70/30. 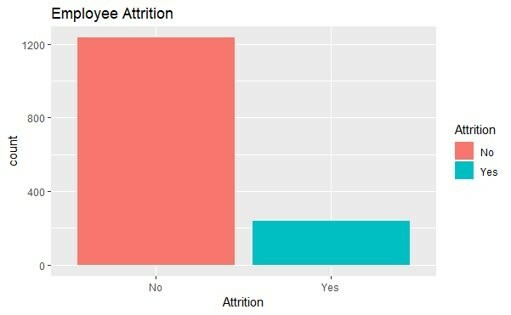 Looking at the overall employee attrition rate for the entire dataset we can see it’s ~19%. Typically, a goal for a company is to keep this rate to ~10% and this dataset shows almost double that rate. Here we show the influence of all factors on the employee attrition rate which shows the influence levels are similar. However, we can take the top factors and explore those in depth. 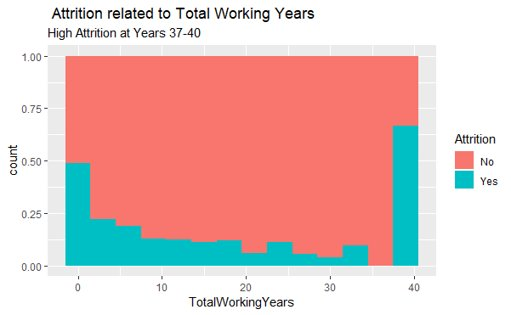 Looking at the total amount of years an employee has been in the workforce (at any job) there are two significant points to be found. First, in the initial 3 years of working, the data shows the attrition rate of 50%. This is expected as people tend to start at an entry-level job and get their first job experience before moving on. The rate drops off in the following amount of years until reaching 37 – 40 years in the job force. Here we have just under ~75% attrition rate which can be best explained as employees retiring since 37 years from 18 is 55 years old, the age people usually retire at. The findings related to the number of years at the company and employee attrition followed the same trend as total working years did but with the rate lower for each. The reasoning behind this is most likely the same as total working years, with early on moving around. Then, staying put and finally retiring. 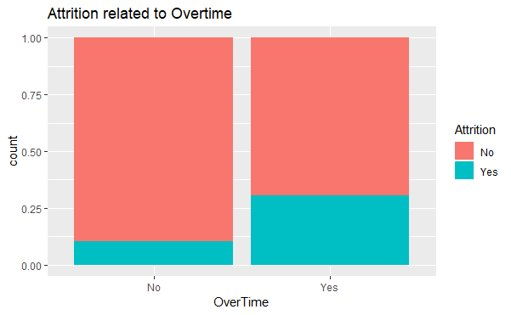 Employees that work overtime have over double the attrition rate (~25%), then those who don’t (~10). A possible reason behind this could be that some employees can get “burned out” working overtime. Possibly want to spend time outside of work and end up looking for a new job. 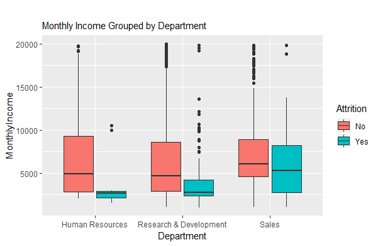 As expected employees with a higher monthly income were less likely to leave a company. Specifically, in the human resource and research and development departments. The sales department was interesting in that monthly income wasn’t as big a factor in attrition. Using a GBM model with default parameters, the best training model came at 88%, at 150 trees. Using this model, we can create a prediction using the test data. The accuracy of this prediction was 87% which being very close to the training accuracy shows this is correct. The classification tree built with default parameters showed a slightly lower overall accuracy. The training accuracy came to 82% and the prediction was 83%. 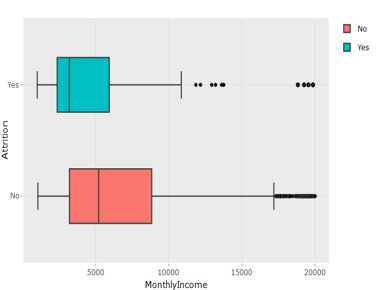 When building a classification tree with only the top 5 factors, the accuracy fell in between the other two models at, 84% training and prediction. 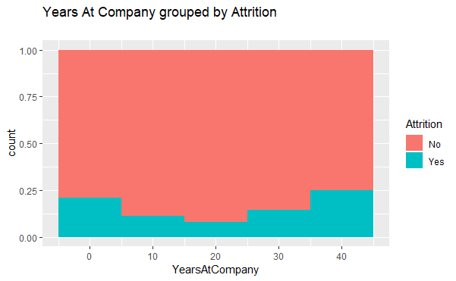 As we can see from this data analysis, the biggest factor to employee attrition is the length of time in the workforce either at the same company or not. However, I would recommend looking deeper into employees that work overtime and getting their reasons for leaving. Possibly, have meetings with overtime workers and find out if they need help. For example, if they are working at their capacity and still having to work overtime then might be time and possibly even cheaper to hire extra help. I would also recommend for the company to continue to collect this same type of data at an annual basis and run the models to find those employees that are more likely to leave. Once you have the list of employees, set up reviews and see if their’s a way to help them out or even you may catch, worker issues early on. Lastly, a further review into the sales department is warranted with the high attrition rate.